Tempeh is a traditional soy product originating from Indonesia. It is made by natural culturing with Rhizops moulds and controlled fermentation process that partially digest the beans and binds soya beans into a cake form. 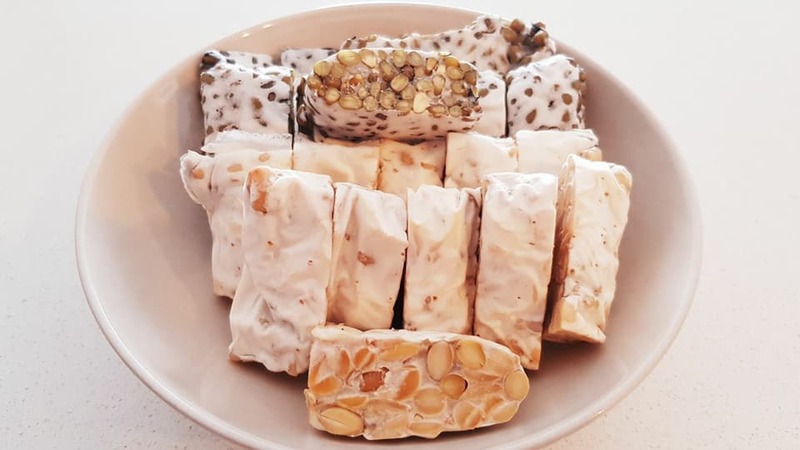 The resulting tempeh is more easily digested than unfermented soy, as the fermentation decreases oligosaccharides and phytic acid. You will also learn how to process your beans and grains so that they are more digestible even without the fermentation process. Tempeh is very high in protein and calcium, as well as beneficial isoflavones, has a nutty and firm texture. It is perfect for Vegetarian, vegans or anyone looking for a low-fat and heart healthy source of protein. Tempeh can be eaten raw when it is still warm from fermentation, marinated, fried, baked and added to salads, sandwiches, stews and many more. -Organic and Sprouted Soya bean tempeh that you have made in class. Fees for scheduled classes must be paid in advance via bank transfer/Paypal(includes paypal admin charges)/Paylah in order to secure your booking. Your booking is only confirmed once full payment has been received. Once your booking is confirmed, no refunds will be given. You are allowed to change your workshop date to the next one if you are not able to attend the workshop. Once you register for the workshop, a separate email with the payment details would be send to you. A minimum number of person is required to proceed with a class. In the unlikely event that a class cannot proceed, We reserves the right to change the date or cancel the class. If that occurs, a full refund will be offered. We will inform you via email.